It’s the beginning of a new year and you know what that means, it’s that time where the “new year, new me” saying is overused and the gyms are full of people trying to fulfill their dreams. That’s right, the new year’s resolutions are back. Will they be fulfilled? Will they be procrastinated until 2019? One never knows. On Pinterest there are multiple ideas of what type of resolutions people should strive for, but most people know what they want to change. Instead of focusing on those parts of Pinterest this is a compiled list of the other side that focuses on “how to achieve your new year’s resolution” instead, which this is more beneficial. Most likely, you will fail at your resolution at some point. This is when people normally give up and stop trying to achieve their goal. The low point is where you have to remain strong and get back up. If you stop then you will end up at 11:59 counting down to 2019 making the same resolution overall creating an endless cycle of the same goal every year. By accepting the failure to come you are acknowledging that you are human and cannot completely change so quickly. This is a slow transition that will take time no matter what the resolution is, so get back up again and start over. The question is how will you maintain this resolution? Think of something that will make you feel obligated to achieve this goal and continue with it. Some use money, putting money into a jar every time you do not follow through. So if your resolution is to go to the gym, if you do not go to the gym there goes a dollar. A year resolution can be intimidating to some people, so creating different monthly resolutions can help keep the “new year, new me” saying more exciting. Now, if you have already made your year resolution create monthly resolutions according to that goal to make it more exciting to achieve. For example, if your resolution is to “read more” start by reading 10 pages a day and then the second month read 15 pages again, then continue to increase the amount as months go one. Every day, write down what you achieved that day that counts towards your goal so at the end of the year you can see how far you have come. This also gives you a sense of accomplishment when looking at the planner at the end of the day. This is difficult to keep up with so if you forget to write down what you did one day towards the goal then either generally say what you did or leave it blank. Be honest with yourself on what you can achieve. Instead of being ambitious and taking on a whole new lifestyle, start to change your mindset slowly and the resolution will come true. If you have never set foot in a gym and suddenly claim, you will go to the gym six days a week that is clearly unrealistic. Start out slow with resolutions and build them up so you are not at the end of 2018 saddened over the fact you never achieved that resolution you promised yourself. This is cliché, but if you truly want to achieve this goal you will, you just have to set your mind to it. When people really want something they tend to put so much pressure on that idea/goal. Instead of creating a pressure-filled resolution, keep it slow and allow yourself to change into the person you want to be. 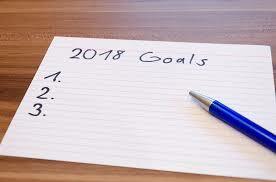 Keep your mind on the goal and where you want to be as a person by the end of the year. Remember, if you fail it is not the end of the world, you can always try again in 2019.